the top sellers in the category. available in 3 beautiful marble colors. mission statement, name, or even a custom image. 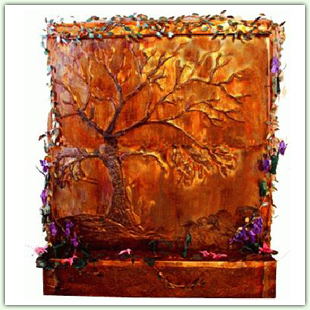 painted fine art image set in a copper frame. 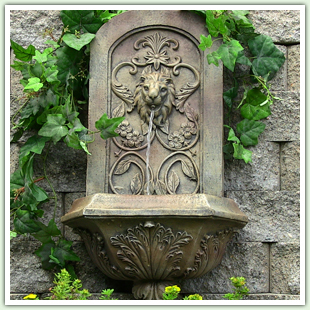 a stone wall fountain, many styles and sizes. 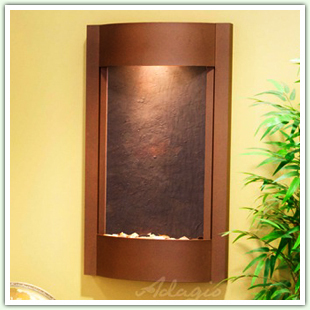 all lightweight slate wall fountains. un-package, hang, fill with water, then turn them on. 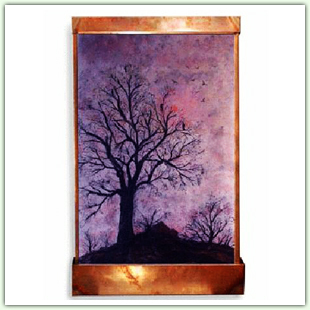 a copper frame. Browse now. any decor. See all mirrored wall fountains here. 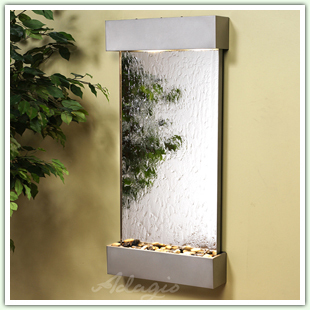 stainless steel wall fountains. Browse entire selection. 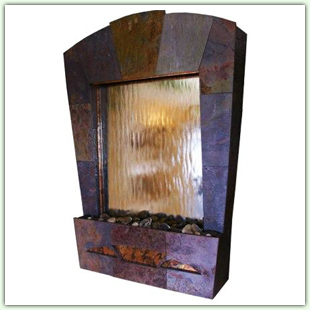 Wall water features are a great addition to any home, office or garden. 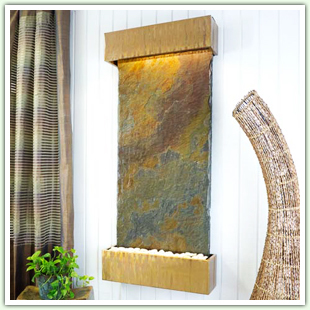 A beautiful focal point in any room or outdoor living space, a wall fountain becomes an elegant blend of art and atmosphere. An additional benefit is the ability to provide soothing water sounds without giving up valuable floor space. 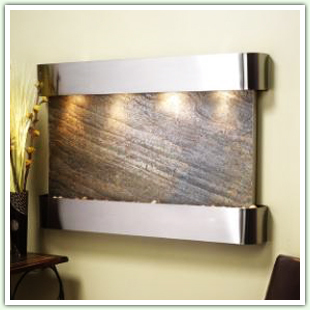 Gently cascading water caresses marble, granite, slate, or artistic backdrops, mingling their elegance with rippling sounds and subtly lighted surfaces. 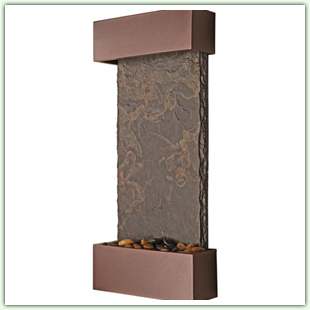 Our wall mounted fountains are available in horizontal or vertical designs, in both interior and exterior models. Materials range from lightweight featherstone slate to heavier slates, marbles, and granites, or reflective surfaces such as stainless steel and mirrors. Others are constructed from waterproof resin or fiberglass, that resembles the concrete, copper and stone relics of by-gone eras. 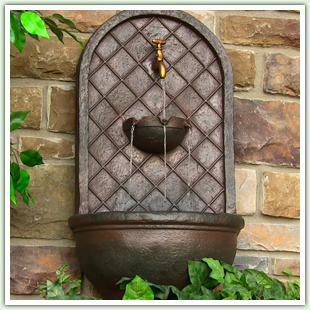 Wall fountains are neither difficult to mount, nor maintain. Heavier pieces should, of course, be mounted on studs. Lighter pieces can be mounted with the assistance of anchor bolts. Informative manufacturer instructions walk you through the steps for mounting them on any surface. 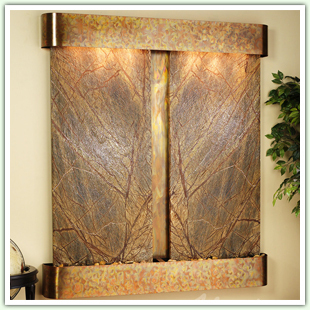 Not only are wall waterfalls perfect for your home as a unique piece of art and to aid in stress relief and relaxation, they are great for the commercial setting as well. Many salons, massage therapists, chiropractors, dentists and doctors place commercial water walls in their public spaces for all to enjoy. They can also be used to reinforce branding when they are customized with the business logo.